Nonfarm payroll employment in March increased by 196,000, seasonally adjusted, from February and by 2,499,000 (1.7%) year-over-year (y/y) from March 2018, the Bureau of Labor Statistics (BLS) reported Friday. The unemployment rate was 3.8%, unchanged from February and down from 4.0% in March 2018. Construction employment increased by 16,000 for the month and 246,000 (3.4%) y/y to 7,447,000, following a decrease of 25,000 in February amid widespread, unusually severe weather. Average hourly earnings in construction rose 3.3% y/y to $30.45, 9.9% above the average for all private-sector employees ($27.70, a 3.2% y/y increase). The unemployment rate in construction, not seasonally adjusted, fell to 5.2% in March 2019), and the number of unemployed jobseekers with construction experience declined to 490,000 (down from 696,000). These were the lowest March figures in the 20-year history of both series. (Not-seasonally-adjusted data may be affected by normal weather and holiday patterns and thus should not be compared to levels in other months.) Average weekly hours in construction rose to 39.9, the highest March level in the 14-year history of that series. The industry's record-low March unemployment and record-high March hours suggest contractors would have hired more employees if they could find them. Two new surveys show stable current conditions for construction. 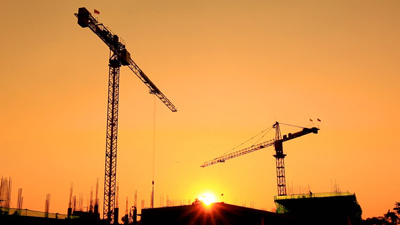 Engineering News-Record reported on Wednesday that its quarterly Construction Industry Confidence Index (CICI) "remained static at 59 in the first quarter of 2019 from the previous quarter ending last year. Of the 205 executives from large construction and design firms responding to the survey, many believe the market will begin to decline sometime in 2020. This sense of an impending downturn doesn't mean that the current construction market is in trouble. Only 3% of survey respondents believe it has started to decline now, and only 6% say it could start in three to six months. On the other hand, 25% speculate the market will start to shrink in the next 12 to 18 months, compared to only 15% who believe it will still be in a growth mode in that timeframe. The CICI measures executive sentiment about the current market, where it will be in the next three to six months and over a 12- to 18-month period. A rating above 50 shows a growing market....The contrast between what the industry is seeing in the current market and what it expects to see next year is even more dramatic in the soon-to-be-released results of the latest Confindex survey from the Construction Financial Management Association" (CFMA), which show that chief financial officers "are worried about the market climate in 2020. Each quarter, CFMA polls 200 CFOs from general and civil contractors and subcontractors. The CFMA Confindex is based on four separate financial and market components, each rated on a scale of 1 to 200. A rating of 100 indicates a stable market; higher ratings indicate market growth. 'The Confindex fell from 114 in the previous quarter to 109 in the current quarter,' says Stuart Binstock, CFMA's CEO, noting it is the lowest rating since late 2010, when the industry was struggling to climb out of a deep recession....The forward-looking 'general business conditions' component plunged 11 points, to 102, while the 'year-ahead outlook' took a similar dive, falling 10 points, to 95. On the other hand, the Confindex components associated with the current market [measuring financial and current conditions] were stable....ENR's CICI survey asked whether firms were seeing upward price pressure on any materials or equipment. While 70.4% of CICI survey execs said they were seeing price pressures, this is down sharply from the 87.2% in the third quarter survey and 80.5% in the fourth quarter who saw rising prices." "Total engineering and construction spending for the U.S. is forecast to end up 3% in 2019, compared to up 4% in 2018," consultancy FMI reported on March 28 in its first quarter 2019 outlook report. "Spending growth in 2019 is expected to be led by public investment across both nonresidential buildings and nonresidential structures. Current top-performing segments forecast in 2019 include transportation (+9%), public safety (+6%), educational (+5%) and manufacturing (+5%). Forecast bottom-performing segments in 2019 include religious (-5%), multifamily (-5%) and lodging (-2%). Key segments that were upgraded into our growth category going into 2019 include educational, manufacturing, and highway and street. Various others appear to be stabilizing this year, including three prior growth segments from 2018: single-family residential, amusement and recreation, and sewage and waste disposal. Both lodging and multifamily were adjusted into our down category this quarter with anticipated declines realized through the remainder of the year." Under regulations adopted by International Maritime Organization in 2008 that take effect on January 1, 2020, ocean-going vessels will have to reduce the sulfur content of their fuel from the current limit of 3.5% by weight to 0.5%. Most are expected to do this by blending diesel fuel, which is likely to push up the price of diesel fuel and gasoline. The "U.S. Energy Information Administration (EIA) expects that shifts in petroleum product pricing may begin as early as mid-to-late 2019," the agency reported on March 27. "EIA anticipates that the effects on petroleum prices will be most acute in 2020, and the effects on prices will be moderate after that. However, the regulations will affect petroleum supply, demand, and trade flows on a more long-term basis." The EIA report does not discuss the implications for liquid asphalt prices, which may decline. Earnings—the sum of wages and salaries, supplements to wages and salaries, and proprietors' income—increased 4.4% in 2018, the Bureau of Economic Analysis reported on March 26. For the U.S., construction contributed 0.31 percentage points (ppt) to the growth in earnings. The agency noted, "Construction was the leading contributor to the earnings increase in Nevada [0.61 ppt] and Arizona­" (0.59 ppt). Construction made a positive contribution everywhere except North Dakota (-0.05 ppt).